India launched its heaviest satellite, the GSAT-11, also called ‘The Big Bird,’ from the French space port of Kourou in South America, earlier today. The satellite is expected to provide high-bandwidth connectivity in the country, with data transfer speeds of up to 14 Gbps. The satellite, weighing in at 5,854 kg and costing nearly $85, million, and has a lifetime of more than 15 years. It was launched into orbit by an Arianespace rocket – a European launch vehicle – in a flight lasting 33 minutes. ISRO’s chairman Dr K Sivan noted in the organization’s press release that GSAT-11 was the heaviest and most-advanced high-throughput communication satellite launched by the country. 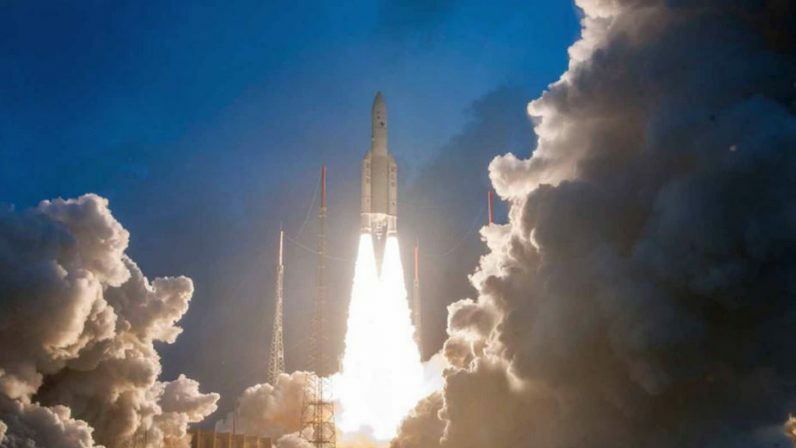 Sivan added that GSAT-11 is the third in a series of four satellites aimed at achieving high data connectivity of 100 Gbps in the country under the Digital India Mission. ISRO described the GSAT-11 satellite as a “forerunner in the series of advanced communication satellites with multi-spot beam antenna coverage” over the mainland and islands. NDTV reported that the satellite is equivalent to the combined power of almost all communications satellites ever sent into orbit by India. According to the space agency, GSAT-11 would provide high data connectivity to users across India to enable e-governance even in rural parts of the country. By setting a base for high internet speeds, the GSAT-11 and its family of satellites can help equip the country with infrastructure for enabling better online services, like AR and VR experiences, and 4K streaming video across areas that aren’t yet well connected.